1-11-2012: Interesting list of fire-arms up for auction at James D. Julia. Nice Erma MP40; Although not entirely number matching I added the serial number again to the list. 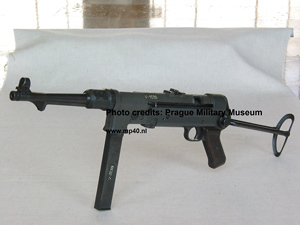 8-7-2012: To my surprise I found out by coincidence that the Army Museum in Delft, the Netherlands is keeper of a collection of 46 MP40's. After contacting them I recently received serial information of 42 MP's of this collection, which is great and will help to further investigate the output of the manufacturers of the MP40. After adding these serial number to my list I will publish it here again. Please let me know if you want to recieve the list in other formats than PDF so you can use it to do your own data mining. 9-4-2012: Drill Sgt. Gunny comes to a nasty conclusion which we need not necessarily have to agree with.................................... The "Chopper" VS the "Schmeisser"
4-3-2012: Interesting link where you can find some e-book downloads and digital articles of MP40 related books. Most of them in Russian but also some in English. Otherwise nice to watch the pictures. Unfortunately not all links seem to work. 26-2-2012: For the collectors under us who have $ 95,000 laying around there is this fantastic opportunity. A MP40/I. Currently I have identified 6 MP40/I. 2 in the USA, 1 in the UK, 2 in France and 1 in Austria. Probably there are a few more. It's a mystery why the MP40/I was on the main regulation D 97 + "equipmentlist (Vorschrift D 97+ "gerätliste") since it was issued in very limited quantities. 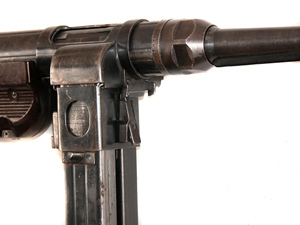 The MP40/I was equiped with the exact same dual magazine system as the MP3008 prototype. 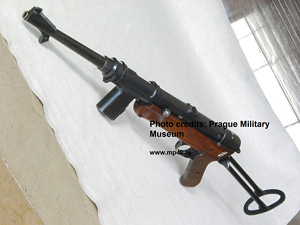 A few mp40's from different factories (different codes) were rebuild and equiped with the dual magazine feeding system. 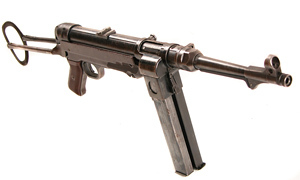 The MP40/I was never newly (of factory) produced. 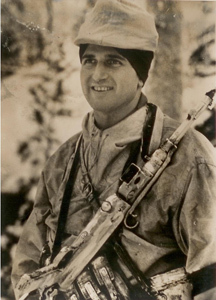 This MP40/I is also featuring in Frank Iannamico "Blitzkrieg". It's currently offered for sale at this website together with some MG's. 21-2-2012: Not seen in a long time. 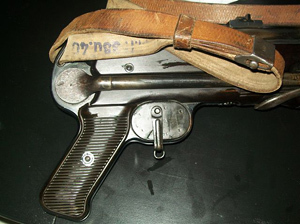 21 MP40's for sale at http://www.raskantik.com/ in the "just arrived" section. Check the rare early "660" coded Steyr MP40's. I haven't seen these quantities since the nineties in Germany.Very nice! 15-2-2012: Interesting find in Denmark.Check the video, MP40 at 1 min 25. I have put the link through Google translate since most of us do not speak Danish! 5-2-2012: Interesting picture (to the right) found on the internet that shows a painted white MP38 as well as the pouches. The MP38 is equiped with the early safety strap. 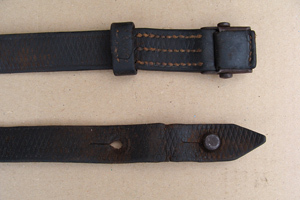 It shows that there are more versions of this safety strap since some are attached to the barrel and barrel protector other are attached to the receiver muzzle. Most of them seem to be improvised in the field and not manufactured. 22-1-2012: The counter has reached 5i6 MP38's, MP40's and MP41's. Please keep me e-mailing those serial number.Serial Database If you want it in Excel or Acces Database format please let me know. 22-1-2012: I have added some more wintertrigger pictures installed on a MP40. Thanks to Rolv. V who was so kind to take some pictures of this rare accessory. Any one who has one for sale please contact me at info@mp40.nl. 21-1-2012: Now for sale at www.raskantik.com 2 MP40's. Soon a lot more to come.